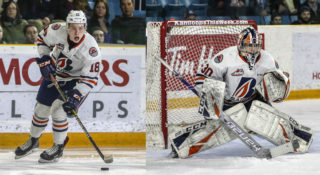 Kamloops, BC – The Kamloops Blazers have two players listed in NHL Central Scouting final rankings. Forward Brodi Stuart is listed at 129th and forward Jermaine Loewen is 160th. Stuart had an outstanding rookie season with the Blazers with 16 goals, 22 assists and 38 points in 70 games. 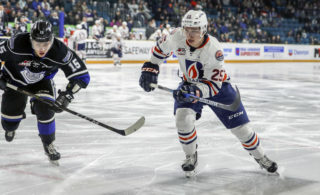 The Langley, BC native was named the Blazers rookie of the year and was also 8th in rookie scoring across the WHL. 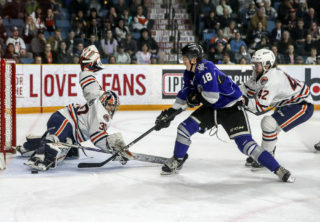 The 17-year-old was selected by the Blazers in the fourth round of the 2015 WHL Bantam Draft. .
Jermaine Loewen had a career year with the Blazers scoring 36 goals, adding 28 assists and leading the team in scoring with 64 points in 66 games. The 19-year-old has been passed over twice in the NHL Draft. Loewen won multiple awards with the Blazers this season including Top Scorer, Plus/Minus, Most Dedicated, Inspirational Leadership and MVP. 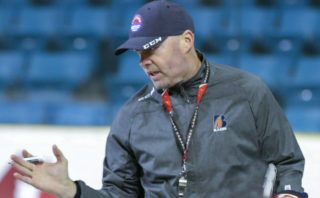 The Arborg, MB native was selected by the Blazers in the third round of the 2013 WHL Bantam Draft.